Charley Hoffman overcame his putting woes to end his final round hoodoo and win the Valero Texas Open. Four shots behind leader Ricky Barnes (74, T4) entering the final round, the 44-year old bogeyed the third and fourth to fall well off the pace and even when he birdied the eighth to give himself a glimmer of hope, he bogeyed the ninth and 10th before a birdie at the 17th gave him a 74 worth a share of 25th on five under par. A tally of 32 putts didn’t help Harrington who hit just two fairways on the front nine and only six all day with a nine-foot par putt at the 15th his solitary successful putt outside three feet. Hoffman, on the other hand, shot a three under 69 to win by one from Patrick Reed, who almost chipped in for eagle at the last before tapping in for a 69. That left Reed tied for first on 10 under with Hoffman, who was in the back bunker at TPC San Antonio’s AT&T Oaks Course after a nervy approach and wondering if his horrific recent final round form was about to deny him again. Memories of a string on Sunday collapses by Hoffman were fresh in most minds but his mishit bunker shot somehow clambered onto the green and sank a slippery, nine footer for birdie and a fourth PGA Tour win that had proved highly elusive. 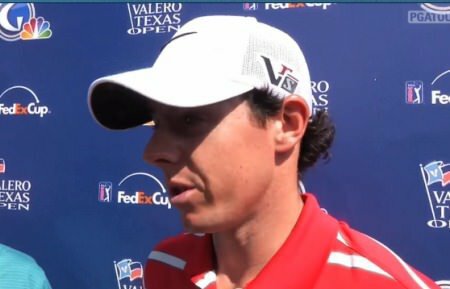 At the World Golf Championships-Cadillac Championship, he was tied for fifth going into the weekend but shot two rounds over par to finish tied for 17th. At the Valspar Championship, he was tied for third going into the final round but shot a 4-over 75 to tie for 11th. At the Shell Houston Open, he led after each of the first two rounds but shot 74-76 on the weekend to tie for 33rd. He wasn’t in contention at the Masters but at last week’s RBC Heritage, he shared the 36-hole lead and was tied for second after 54 holes until shooting a 4-over 75 (sound familiar?) to drop into a tie for 14th. Collectively in the 16 rounds of those four tournaments, Hoffman had a top-10 position on the leaderboard after 11 rounds, and yet failed to actually finish inside the top 10. No wonder he ranked 200th on the PGA TOUR in final-round scoring average heading into this week, nearly 5 shots higher than his opening-round average. “It’s about time” was a constant in Hoffman’s post-tournament comments. “It’s been a rough month and a half,” Hoffman said. “That’s where ‘It’s about time’ comes from. Obviously I had good feelings coming into this week and knew I needed to close the door. Harrington wasn’t the only European to leave Texas feeling disappointed. Luke Donald, who came close to winning the RBC Heritage in is previous start, went into the final day two shots behind but lost his swing and carded a 74 to finish tied 13th on seven under. On the Web.com Tour, West Waterford's Seamus Power tied for 15th in the El Bosque Mexico Championship. Power's final round was a true rollercoaster affair as he made a double bogey seven at the first as well as five bogeys, but replied with an eagle three and five birdies (three of which came in his last four holes). Power is now 66th in the money list.